We never heard the word lavash outside Armenian circles until just a few years ago. Now, it pops up everywhere from supermarket aisles to fast-food menus -- and it can have very different meanings. Traditional Armenian cracker bread, crisp to the bite and mottled with brown bubbles, is a true staple that could sustain a traveler on a long journey or a family through an even longer winter. It seems to keep forever, and can be savored as is or softened with a drizzle of water or oil. Yet somehow in America, it has shrunken and morphed into a mere appetizer, often with the texture of vinyl floor tiles. Equally odd is what's happened to the delicate, flaky soft version that Armenians not only eat with their meals but eat their meals with -- the perfect edible utensil that can be used to pick up meats or sop up stews. But if most Americans recognize the word lavash at all, they picture a sandwich wrap that seems more closely related to a wheat tortilla, and most likely is just that. Luckily, we know and love yet another version of lavash that is uncorrupted by commercial success. In fact, even most Armenians aren't aware of it. This lavash combines the best of both traditional styles: Crisp and bubbled on top, soft and flaky in the middle. Be warned: It's rich, buttery -- and addictive. 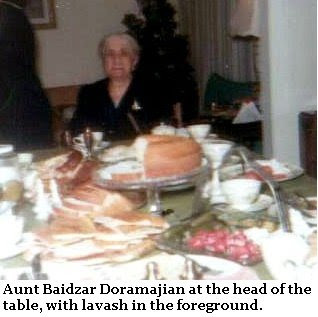 It's also something of a family treasure, handed down by Doug's mother who learned it from her clan's master chef, Aunt Baidzar Doramajian. We'd hate to see it turned into some sort of snack cracker, or worse. So please, let's keep this between us! ** Test the baking powder before using to make sure it is active. To do this, sprinkle a little baking powder in a half cup of water. The powder should begin to bubble and foam. If it doesn't, the baking powder should be discarded. and sugar into the flour. Stir well. 2. Add the melted butter and MOST of the water. 3. Mix well until a dough forms. If the dough seems too dry, add some of the remaining water and continue to mix. 4. 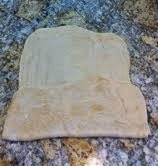 Knead the dough on a lightly floured surface until smooth. 5. 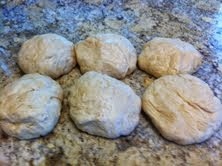 Divide the dough into 5 or 6 balls. 6. 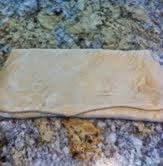 Roll one ball of dough at a time into a rectangle shape that will fit on a 16"x12" baking sheet. 7. 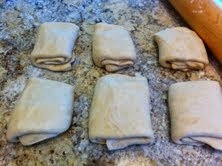 Fold the rectangle-shaped dough into thirds, then in thirds again, creating a little bundle. 8. Re-roll each bundle into a large rectangle again. 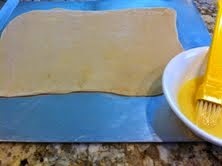 Place rolled dough on an ungreased 16"x12" baking sheet. 9. Preheat the oven to 425°F. 10. Brush the surface with egg wash.
11. Bake on the lower oven rack for about 15 minutes, or until bottom starts to brown. 12. Move the tray to the upper oven rack for about another 5 to 10, or until the top becomes a golden brown. 13. Remove from oven. Cool completely. Cut into 12 or 16 pieces. 14. Continue this process until all balls of dough have been shaped and baked. 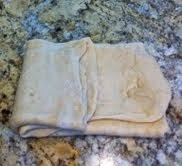 NOTE: The lavash will be chewy-crispy, rather than soft. 16. Serve lavash with cheese and fresh fruit. These recipes are like the ones I grew up with...do you have one for kufta...bulgar outside and meat and onions, etc inside? I tried this recipe. The lavash in Armenia is different though. I do not see a recipe for Khash (cow hoof broth). We ate that with dried lavash put into the hot broth, at the Aragat summit restaurant. Ah, yes... Khash. As soon as we can find the necessary ingredients and the weather cools down (in So. Florida), we intend to give khash a try...with lavash, of course! 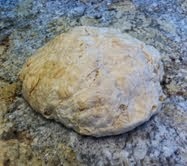 I make a version my grandma used to make that uses yeast and you let rise and then roll it out and cook it. Rob, are willing to share your grandmother's recipe? If so, please email it to: robyn@thearmeniankitchen.com. Thanks! Could you please clarify the folding part. What is it for? The folding and re-rolling creates somewhat flaky layers. What could I use instead of an egg wash? You can use milk, cream, melted butter, oil, or water to glaze the dough, however, none of these will provide the shine that an egg wash does. Lavash can be a soft flatbread, but Jessamyn Waldman developed this recipe based on Armenian-style lavash, which is very crisp and dusted with seeds or spices. 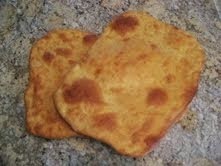 This type of flaky, folded flat bread was known in my grandmother's house as saji hatz, not lavash. Can you cook this on the griddle? Are your recipe's mostly western or eastern Armenian, I recently traveled to Armenia and found the food delicious, however, not exactly how my grandmother would prepare them, as she was from the area that is now in Turkey, which was western Armenia. The recipes from The Armenian Kitchen are mostly western Armenian, and some with an American twist!